Churchyard Clean-up Thanks and More! A million thanks to all those who came along to clear the bottom corner of the churchyard of huge tree roots, bricks and assorted debris including a crisp packet best before 1989! Let that be the proof that these things don’t rot down 30 years on. Following the donation last month to St Katharine’s Church to be used in the churchyard, a gang of volunteers started on the job of tidying up the bottom corner of the churchyard where the rhododendron bush has been taken out. 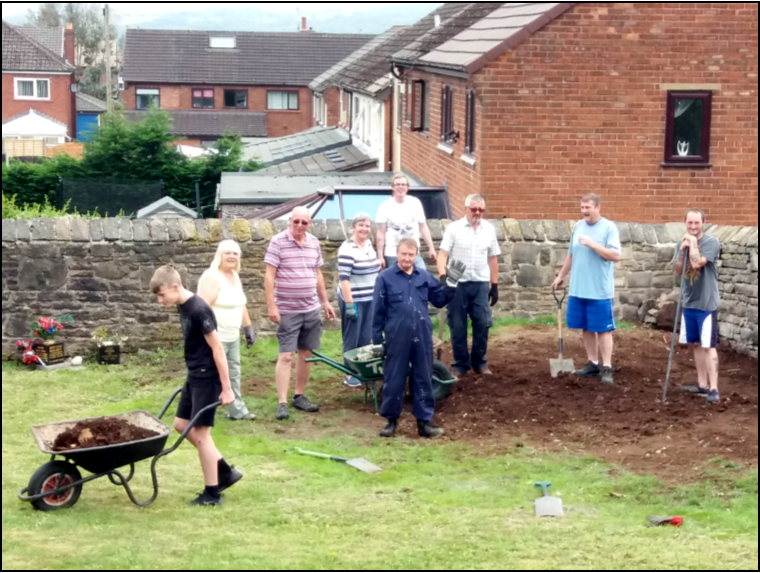 A skip was hired and Westgate Building Contractors from Wingates attacked the root systems – something even our willing gang would have struggled with! Stones were moved and it took 4 people to lift the root into the barrow! The area has been reseeded and we hope it will become a special quiet corner for people to enjoy. Thank you to male and female helpers, Westgate, and our anonymous donor for your support. The church is open during services and is also open Tuesday mornings, 10 am - 12 noon and Thursday evenings, 7 - 8 pm to book rooms, for general enquiries and to arrange baptisms, weddings, banns etc.